Top grain leather is the outermost layer, and represents the strongest part of the hide. Top grain is what you will see most often in high-quality upholstery. It is smoothed to remove imperfections in the hide. Full grain leather is the same as top grain (it’s also the outermost layer), but isn’t smoothed. It comes complete with all of its natural grain and imperfections, such as scars and pores. 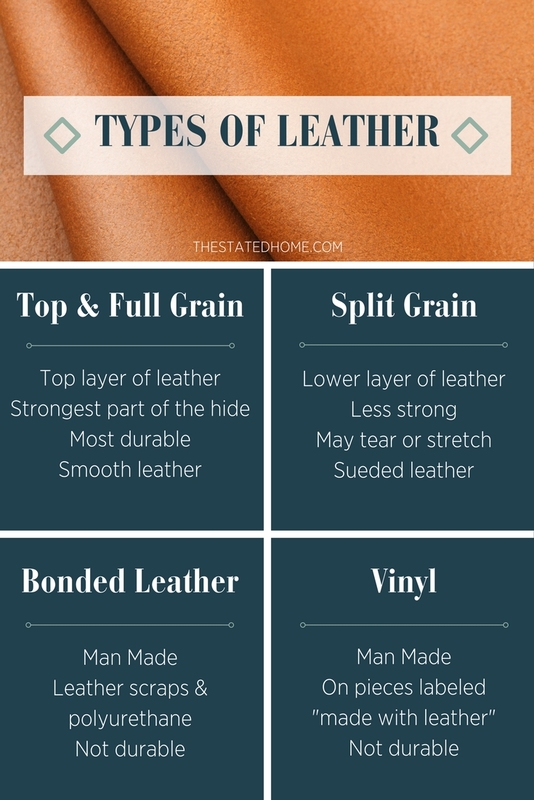 Split leather is the term often used for the lower layer that is left after the full grain or top grain is removed. While it is still “genuine leather,” it’s not as strong as the first two categories and may tear or stretch. Bonded leather is a man-made fabric made of ground-up leather scraps and polyurethane. The end result is a product that looks like leather, but without the durability or feel of natural leather. Unfortunately, it’s often used to mislead buyers into thinking that they are purchasing the real thing (just look at the TV ads pushing bonded leather sofas and recliners for rock-bottom prices). A vinyl leather look-alike may sometimes be used on the sides or back of a piece with real leather on the seat and arms. Just because a product is labeled as “made with leather” does not mean that it is completely upholstered with leather. Buyers beware! 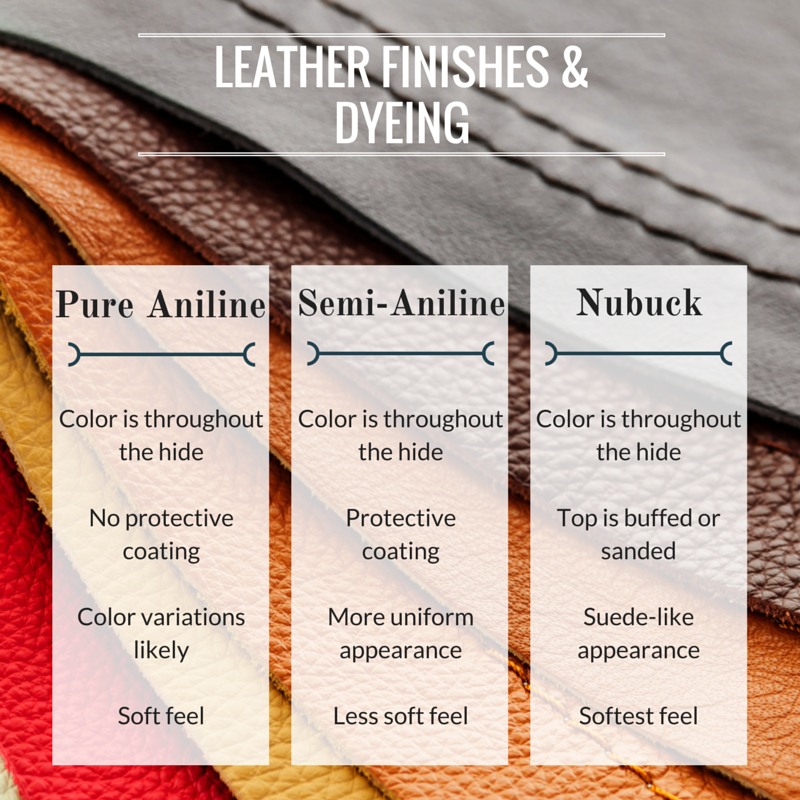 Now that you know the different categories of leather, let’s turn to the various types of finishing. Each of the following dyeing processes yields a leather with a different appearance, feel, and durability. The one that is right for you depends on your lifestyle and personal preferences. Pure Aniline (also called Full Aniline): Aniline dyes permeate throughout the hide, so that the color goes all the way through. That means if it gets scratched, the color won’t change. Without a surface pigment, variations in color are likely. 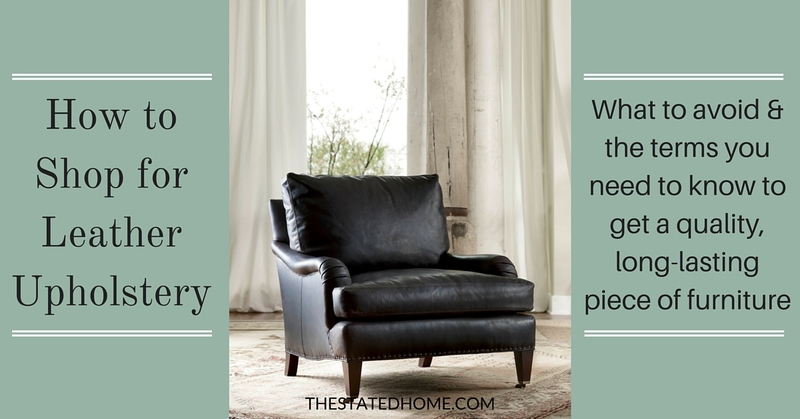 This type of leather has the softest feel since there’s no protective coating, but is more susceptible to scratching, staining, and fading because there is no protective coating. Semi-Aniline or Aniline Plus Pigments: This process starts in the same way as Pure Aniline, but after the hides are aniline-dyed so that the color permeates them, they are given a protective topcoat. An additional coat of color may also be applied to provide a more uniform look while still allowing natural markings and grain to show. The end result is a leather that is more protected, although not quite as soft as Pure Aniline. Nubuck: Pure Aniline leather may be buffed or sanded to create nubuck. The result is leather with a soft, velvety feel and suede-like appearance. Although stronger than suede, which is made from split leather, Nubuck is very susceptible to fading and soiling and will develop a patina over time. One other note about dying processes: Bonded leather and vinyl only have a top coat of color that had a tendency to expose the material underneath when scratched and can peel and crack – another reason why we don’t recommend it or sell it. The Stated Home carries Lee Industries leather upholstery in all three dyeing styles (Pure Aniline, Semi-Aniline, and Nubuck). Lee uses only top grain and full grain leathers, so you don’t have to worry about getting a piece made with split or bonded leather or with leather-look vinyl on the back. 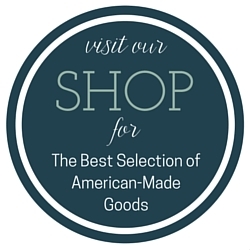 We make sure that the quality and craftsmanship of your leather furniture meets our standards. Because leather is a natural product, it is also unique. No two hides are the same, so no two leather sofas will be the same.